First developed in 1981 by computer scientist Chase Bishop who called the software project "Interface Manager," marketers at Microsoft later decided that the name "Windows" was more consumer-friendly. The software was formally introduced under its new name in 1983 as a graphical user interface for the MS-DOS operating system running on IBM PCs and those compatible. Until Windows 95, the software was just an .exe that took over the screen of DOS. 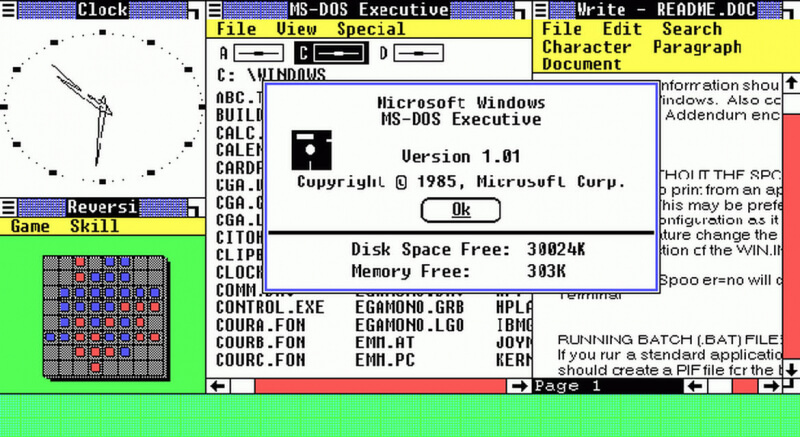 Windows 1.0 was released to manufacturing in November 1985 and included graphical versions of software including Calculator, Calendar, Clipboard Viewer, Clock, Notepad, Paint, Reversi, Cardfile, Terminal and Write. Windows could not be overlapped and were instead tiled on the display (Windows 2.0 brought the more traditional window functionality).